Campbell’s had decided to close a plant in Michigan and was relocating some of the equipment to another facility in Washington state. (Ironically W. Soule has fabricated and installed much of the equipment used in that plant over the past 30 years.) The equipment was decommissioned in 2011 and would need some repairs and enhancements. The new location is a different size so a new set-up needed to be designed and implemented. Our Process Integration format provided Campbell’s with a one-stop shop solution. Our team of millwrights, custom fabricators and pipefitters were able to handle the project from start to finish. Budget, timeline and scope of work were determined and agreed upon. Necessary repairs and enhancements were also identified based upon the current state of the equipment and the new configuration. Our team went to work in the closed plant removing the equipment. Dumpers, breakers, conveyors and augers were removed, loaded onto our enclosed truck and taken to our Soule Fabrication Group’s shop for redesign. The W. Soule design team and custom fabricators jumped into action. The equipment would be used in a new, more confined configuration so equipment was realigned and supplemental pieces were fabricated. A new hydraulic dump system was also designed and fabricated. Worn parts were replaced and guarding and safety features, which were not originally required, were added. Structures, platforms and brand new electrical and controls were added. One of the benefits of our fabrication space (over 120,000 sq. ft.) is that we can assemble large pieces like this in our facility, test alignment of components, and validate the process, greatly reducing the disruption in the manufacturing plant. When the equipment rebuild was complete, a representative from Campbell’s visited our shop to review the equipment prior to delivery. 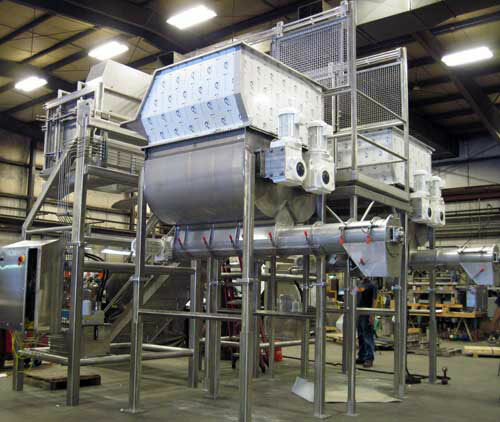 What they saw was two completely redesigned IQF process handling systems erected as they would be in their facility. The set-up was broken down into large pieces to be loaded, delivered and installed in Washington. Because the equipment had already been assembled in our shop, our installation team was much more efficient at the final destination, mitigating Campbell’s risk. Our team had the line up and running before they left, leaving Campbell’s with peace of mind that the project was complete. This project took our Process Integration one step further with the development of care manuals. The W. Soule project team developed an Owner’s Manual complete with routine maintenance diagrams, instructions and a list of spare parts to inventory. W. Soule is proud to have a legacy of work with Campbell’s. Our success in the food industry has given us the experience to put our Process Integration skills to work taking care of our clients’ needs from start to finish, mitigating their risk for lost time and cost.